Our organization offers a wide gamut of Brass Automobile Parts that we manufacture using high quality brass and employee latest available technology to fabricate them. Highly durable, have accurate structure, highly malleable,and resistance to corrosion some of the important features of our product. Our products are used at large in various industries in different auto electrical applications. We make available brass automobile parts in different sizes, shapes and dimensions. We manufacture and supply an array of Brass Horn Parts that are made using high grade brass. These parts enable a complex horn machine function simultaneously. Offered at standard market prices, these parts are durable in their characteristics. Having accurate structures, the product range is also corrosion resistant. Further, we also offer customization as per the needs and requirements of the customers. 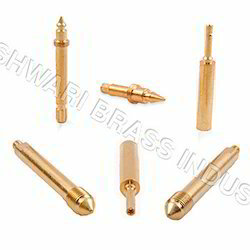 We are into manufacturing and supplying of an assortment of Brass Auto Parts. Our extensive range has a wide application in variegated automobile industries. Enabling these industries to accelerate their performances, these auto parts are made using latest technologies and optimum quality brass. We also cater to the specifications provided by our clients and offer them customization service. Pressure Gauge Parts enable a pressure gauge to work efficiently. These parts assist the pressure gauge machines in measuring the internal pressure or vacuum of a vessel or system. Ensuring the high grade range, we also offer customization services to our clients as per the needs and requirements they have. Regarded for the durability, the entire range is highly reliable as well. We offer a vast range of Rear View Mirror Parts that are manufactured using optimum quality brass that we procure from trusted vendors. The product range allows the automobile mirrors to be adjusted. Enabling the smooth functioning of automobile viewers, these brass automobile mirror viewer parts are highly acclaimed for their precision designing and durability. Engrossed in the manufacture and supply of a vast range of Side View Mirror Parts, we are a renowned name for the quality products we offer. These parts are designed, built and tested before being made available. The premium quality brass used in the manufacturing process ensures the durability of the product range. The entire range is made available at competitive prices in the market.